Quartz, Calcite, Galena, and Sphalerite (both marmatite and cleophane varieties) from Bulgaria. Very showy pieces, many with associated dolomite, pyrite, and chalcopyrite. Prices range from $5-150, with most under $30.This is just a small sampling of the over 200 specimens that we obtained on our 2016 trip to Bulgaria, as well as a few pieces that we had previously obtained. NEW! _ __Pyrite on amethyst, Chalce Mine, Haskevo region, Bulgaria (#G18-156, $36). This specimen ia about 3.5 inches across and 1.75 inches tall. We have a few more of these showy specimens, priced from $24-$36. __Dolomite on quartz, 9 September Mine, Madan District, Bulgaria (G17-208, $18). __Galena, sphalerite (var. marmatite), and quartz, 9 September Mine, Madan District, Bulgaria (#G14-237, $48). __ __Sphalerite (var. 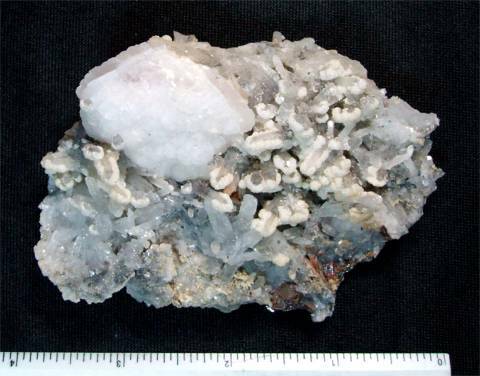 cleophane) on quartz, 9 September Mine, Madan District, Bulgaria (#G17-038, $70). The yellow-green sphalerite crystals are very gemmyon this specimen. __Manganocalcite, calcite and quartz, Krushev Dol Mine, Madan District, Bulgaria (#G13-225, $40). The manganocalcite fluoresces bright orange under short-wave UV light.